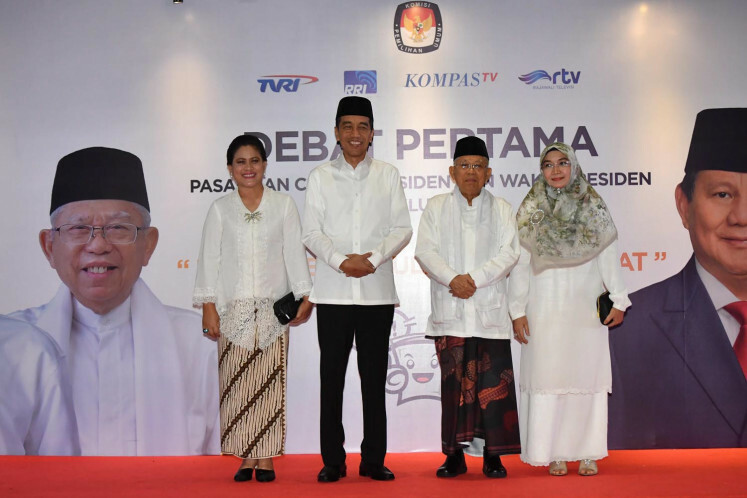 Who dressed best for the first presidential debate: Jokowi or Prabowo? 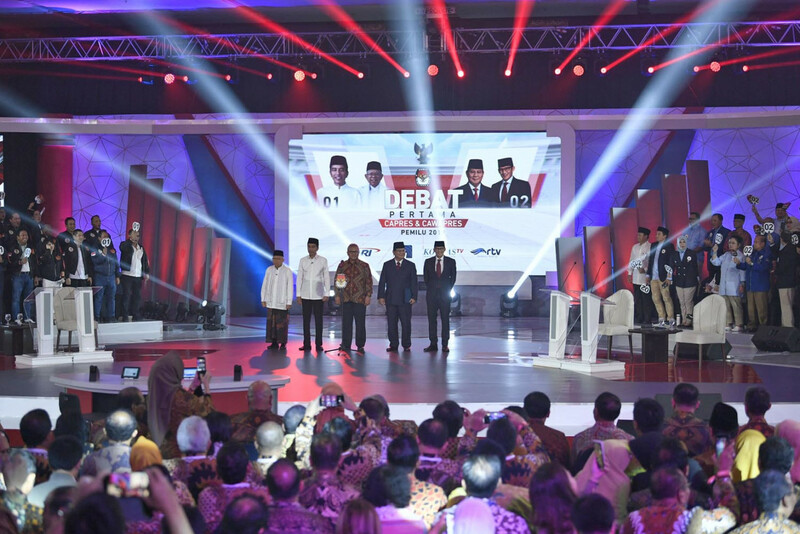 On Thursday evening, all eyes were glued to the television for the first round of the 2019 presidential debates, a rematch between President Joko “Jokowi” Widodo and Gerindra Party chairman Prabowo Subianto – who also contested the 2014 presidential election – along with their respective running mates Ma’ruf Amin and Sandiaga Uno. In addition to their arguments, the candidates’ fashion choices were among the topics under discussion. Both the incumbent and challenger played it safe when it came to their fashion choices for the first debate. Ahead of the debate, Jokowi shared that he would wear a tenun (traditional woven fabric) shirt. However, he and Ma’ruf, along with their wives, arrived at the venue donning white apparel. A plain white shirt has clearly been Jokowi’s go-to apparel since he was the mayor of Surakarta and later the governor of Jakarta. He even wore a plain white shirt during the announcement of his Cabinet lineup. In fact, a plain white shirt is the Cabinet’s dress code and is said to symbolize the wearers’ duty to touch people's lives with their work. Similar to Jokowi, Ma’ruf also dressed in his signature style for the first debate, a sarong with a belt beneath a plain white shirt. However, his usual checkered sarong was replaced with a batik sarong. It was no surprise, as Ma’ruf had said earlier that he would wear a sarong to the debate. In September, the non-active chairman of the Indonesian Ulema Council (MUI) told hundreds of santri (Islamic boarding school students) in Kediri, East Java, that should he be elected in 2019, he would maintain his penchant for santri fashion style by regularly wearing a sarong. 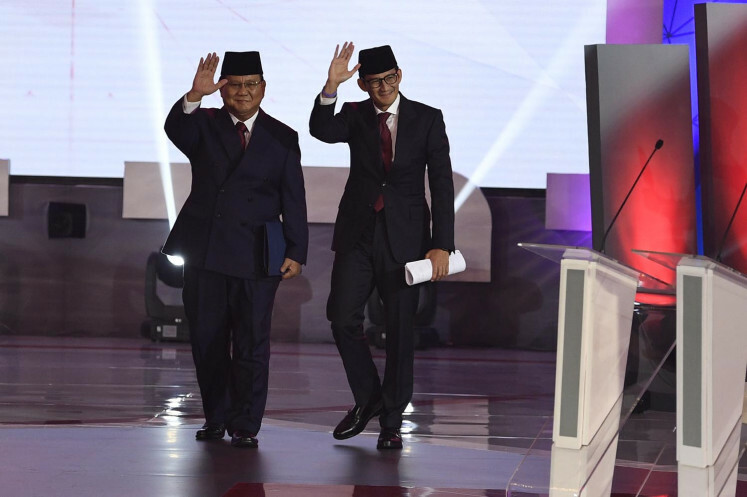 As for the challengers, both Prabowo and Sandiaga came dressed in suits, looking sharp and ready for the debate. Prabowo’s blue suit matched his supporter's blue apparel. Prior to the debate, Sandiaga told kompas.com that he would wear blue throughout the campaign as the color represented calmness, unity and his fight for blue-collar workers.